The EPB cable programming garden is in full bloom! Recent system upgrades are making it possible for us to add several new channels, one or two of which should be of interest to someone, or everyone, in your house. Of course, we have already discussed the big one . . . The Disney Channel is now available to all Glasgow Classic customers on channel 35. This channel is very popular with everyone from three years old to about thirteen or so. A companion channel called Toon Disney is now available to digital tier subscribers on channel 134. As the name implies, it is chock full of Disney cartoons. If you love Big Bird, The Count, Elmo, and the whole Sesame Street gang, you will love our new programming on channel 133 – PBS Kids Sprout. Channel 195 is now WKRN’s 24/7 Nashville weather station which will give the perennial weather watchers among you another way to keep up with the regional weather at any time day or night. For those of you who purchased a high definition television and subscribe to our HD tier of programming, we have great news for you too! Channel 517 is now VS/Golf HD. Eventually they might both have a full time HD channel of their own, but right now the folks who own both of these channels are offering this “shared” channel for fans of both VS and Golf Channel. Later on this summer, we hope to also be adding Speed HD, A&E HD, HGTV HD, Starz HD, Food HD, and National Geographic HD. We hope all of this programming helps you enjoy the extra time at home that many of us will be experiencing as the price of gasoline makes it more attractive to stay at home. At the EPB our job is to make your life in Glasgow better. We hope this new programming helps accomplish that goal! Last night the evening news ran a story about the possible demise of the airline industry. Fuel prices and weak economic conditions, they said, might cause two hundred cities to lose access to commercial airlines. The cost of the remaining air travel options might be so expensive that regular air travel by families for vacations and quick visits to distant cities might put such travel out of reach for all but the wealthy. As a former frequent flyer, this story left me feeling pretty sad. 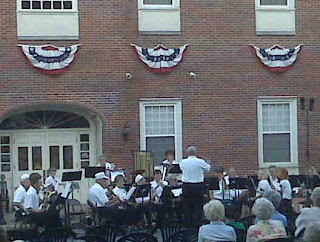 After the news went off we went downtown to the courthouse square to take in a concert by our Glasgow Community Band. Walking down South Green Street toward the square, I couldn’t help but notice the infrastructure; the technology that makes Glasgow a community. There are the streets, sidewalks, utilities, fire trucks, police cars, ambulances, and many other technological wonders that we purchase for ourselves. These are the infrastructure items that we all count on and accumulate in a passive manner. That is to say, we pay for them with our taxes and utility bills, but are not generally personally involved in. Those are nice, but the really wonderful elements of our infrastructure are the ones people provide from their inherent pride, generosity, talent, and commitment to improving the community without any direct benefit to themselves. Those include well maintained and renovated homes, lawns, and landscaping. Of course, the biggest item that was on display last night was the Community Band. That is Glasgow infrastructure as well, and it exists only because a handful of locals care enough about the rest of us to commit the time and energy necessary to allow their individual efforts to combine with those of others to produce beautiful music. Fire engines and utility lines are nice and useful, but anyone with enough money can buy them and all communities have them. Our Community Band is not something other towns have. It is special. It comes from that underlying current of civility and community that cannot be established with tax dollars. It is a special bit of technology that we are all so lucky to have. Last night hundreds of locals sat on our own lawn, under a crystal blue sky, in front of the City Hall that we bought and paid for, and were entertained by a group of our fellow citizens simply because they could. Children giggled and waved blades of grass in unison with Bill Brogan as he waved his conductor’s baton. Friends and neighbors shared all of this with each other during an evening so perfect that you were expecting to wake up and find that you were dreaming. We all enjoyed the kind of evening that so many folks load themselves up into airplanes and travel great distances, at even greater expense, in the hope of experiencing. Many of the attendees did that just by walking down the street. We discovered vacation level happiness on a Tuesday night right here in Glasgow. On the way back home I started thinking again about the evening news and the demise of the airline industry and the fact that more folks are going to need to find their entertainment at home. I pondered this as we walked back up South Green Street. I pondered the demise of cheap air travel and I finally said . . . who cares. Well, it is official. We are going to add The Disney Channel to our Glasgow Classic tier of programming (Channel 35) before the end of June. We will also be adding Toon Disney to our digital tier about the same time. It has been a long time since we offered Disney Channel on our system. We simply felt like they were charging way too much for it. Actually, we still do, but we cannot ignore the fact that they are producing some of the cleanest and most popular programming for young folks that is available anywhere right now. We also recognize that rampant increases in the cost of gasoline and all other sorts of fuel will result in more folks staying at home instead of traveling for recreation. So, enjoy! Disney has several blockbuster programs scheduled for the end of June and for the rest of the summer including programs like Camp Rock, Who's That Girl, and Jonas Brothers Band will be everywhere. Tell everyone you know...the long Disney drought in Glasgow is at an end. It is raining mouse ears! One thing is certain, the Glasgow EPB is a small operation. We consist of fifty folks with no interest in any customer outside the good old 42141 zip code. We serve homes and businesses that cover a total population of only about 16,000 folks. In the great big world of electric and cable utilities, we are laughably small. But that does not mean we don’t have a mighty big impact on the economy of Glasgow and the lives of those 16,000 folks. We have. We do, and, in the coming years, we will. This year marks our twentieth anniversary in the cable television business. During those twenty years we have always made sure that the people of Glasgow pay the lowest rates for cable television service in the United States. Even though we just announced a modest rate increase of $1.50 per month which will become effective on July 1, we still blow away the competition. The Census Bureau just released this study relating to cable television popularity and the rates people pay for cable in our country. As you can see if you click on the link, the average cost of cable in 2006 was $41.17 per month. Since this is now 2008 it is very likely that figure is now about $45 per month. In Glasgow, even after our rate increase, you will be paying only $25.75 ($29.75 outside the City limits)per month for the expanded basic package. That differential between our rates and those we would otherwise be paying if we didn’t have our own little locally owned system has existed throughout the twenty year history of our cable efforts. As a result, we have saved the folks around here over $40 million since we got started in 1988! It is certainly worth pondering what Glasgow would look like today if an additional $40 million had left the local economy over the last twenty years. It is not an image I want to dwell on very long. But saving the community money is not the be-all and end-all reason of our existence. We can do a lot more to make Glasgow a better place to live and we are doing a lot of that right now. You see, the EPB team today, just like the folks who worked so hard fifty years ago to bring the EPB into existence, believes strongly that small is beautiful and that a few determined folks at the helm of some pretty powerful technology can constantly improve the life of local folks. To a large extent our team is guided by the principles so eloquently espoused by the great Kentucky writer, Wendell Berry (who writes and farms in the community of Port Royal, just a couple of hours up the road from us). Just a few days ago he was on KET making an observation about our present fuel crisis and how it might finally bring about a change in the way we live our lives in that we might all be traveling a whole lot less. He said, “It is clear that we are going to have to enjoy the places where we are, and, since that is the case, we need to do a lot more work making the places where we are, enjoyable.” The EPB is executing plans to make Glasgow more enjoyable. With respect to electric power, we are well on our way to building a second delivery point so that electricity will continue to be reliable and available for Glasgow’s future. Our planned solution is elegant in that it will provide twice as much capacity as we have today should Glasgow continue to rampantly grow, yet it will also offer a much more efficient solution if our growth is stagnant or if we actually shrink. So, whatever direction our energy usage takes, we are planning an enjoyable and efficient solution. We think that another way to make Glasgow more enjoyable in a world of $4 and $5 gasoline will be an enhanced internet and LAN system capable of affording more folks a way to work from home and leave the car or SUV parked in the garage. As this is written we are anxiously awaiting new fiber connections being installed along the TVA transmission line to Bowling Green and new cable modem management hardware and software to drastically improve the data throughput of our broadband network right here in Glasgow. Finally, it is obvious from the Census Bureau report that increased access to cable television programming is another thing that folks find enjoyable, and we have some great things coming in that department as well. The $1.50 per month increase is going to allow us to bring some new and exciting products for your enjoyment! Very soon PBS Kids Sprout will come to our digital tier of programming and along with it will come 24 hour a day access to great preschooler programming like “Sesame Street” and “Bob the Builder” and some new characters being developed for the channel by the Muppet folks at Jim Henson Company. “The Pajanimals” will be part of the network’s “Good Night Show” block, and, as a relatively new grandparent, I can testify that Glasgow will be more enjoyable at my house when there is new programming to convince certain grand-daughters to go to sleep before I do! In addition to Sprout we will also be adding Golf Channel HD, VS HD, and it is quite likely that we will also be adding (drum roll please). . . The Disney Channel sometime in June. That’s right. After refusing to pay the exorbitant rates employed by the Disney folks for many, many years, we are finally about to cave in to the power of Hannah Montana. She got us in a headlock and we finally are about to say uncle. So, for those of you who spell additional enjoyment M-I-C-K-E-Y, Glasgow is about to get more enjoyable for you too. There are other great things coming to your cable service as well. For example, our digital channel 103 (Discovery Home) is about to become Planet Green. This will be a channel which is calling itself the first 24-hour channel dedicated to eco-friendly living. The folks at Discovery are making a big bet here that “eco-tainment” will appeal to viewers. I think it will. Then later this year we hope to roll out our newest cable television service, VOD (Video On Demand) which will give all of our digital customers a nearly unlimited menu of movies and other programming that they can watch whenever they feel like it. All told, the EPB is working hard to make your life in Glasgow more enjoyable and to ease your pain from beginning the process of withdrawing from a life spent traveling to another location in search of enjoyment. We think Glasgow can be plenty enjoyable! Stick with us and let us show you how.